It is common when once-revolutionary organizations turn toward opportunism that they seek to cover their tracks by smearing and slandering those who continue to uphold the Marxist banner. In the five years since leading cadres of the Spartacist League and other sections of the International Communist League were bureaucratically expelled, the SL/ICL has heaped one lie and invention upon another in its frantic attempts to discredit the Internationalist Group and the League for the Fourth International. Now it is wartime, and the ICL is worried. So it lashes out at the IG/LFI with a new and sinister smear. In the article published below, “SL Flinches on Afghanistan War” (25 October), we reported how the Spartacist League refused to call for defense of Afghanistan against imperialist attack right up to the moment bombs started falling, and how the SL had an internal discussion which decided not to call for the defeat of U.S. imperialism in this war. This had been a subject of heated discussion between IG and SL members in numerous marches, protests and meetings against the war in previous weeks. Now the SL has responded. An article in Workers Vanguard (No. 767, 26 October), titled “The Internationalist Group: Centrist Pathology,” confirms that the ICL does not call for defeat of U.S. imperialism in this war. Instead, it accuses the IG of “Playing the Counterfeit Card of Anti-Americanism” and being soft on Islamic fundamentalism. Indeed, WV accuses us of playing to an audience of “‘Third World’ nationalists for whom the ‘only good American is a dead American’.” What a monstrous lie! This exercise in sophistry “partakes of” sophomoric debaters’ tricks. The IG repeatedly denounces the idea that imperialism is a policy or that the war can be defeated by a “peace movement.” Moreover, anyone can see there is a world of difference between calling to defeat the U.S. and calling to change Bush’s foreign policy. The WV article continues: “From a Marxist perspective, however, there is no way to ‘defeat’ the inevitable drive toward war by the capitalists short of their being expelled from power through victorious workers revolution….” So since it will take nothing less than socialist revolution to defeat the general capitalist drive toward war, the Spartacist League does not call for the defeat of “its own” bourgeoisie in this imperialist war of depredation! As Leninists, we call to defeat imperialism in this war as part of the fight “For International Socialist Revolution!” as we proclaim in red on the front page of the Internationalist special supplement (27 September). As opportunists, the ICL cynically uses this subterfuge to abandon the Bolshevik program to fight against imperialist wars. As if to underscore the point, WV continues to praise black Democrat Barbara Lee, the Congresswoman from the California East Bay area, for casting “the sole vote against the resolution giving Bush a blank check for war” (WV No. 765, 28 September). They have yet to inform their readers that this same capitalist Representative voted for the $40 billion emergency war budget that literally gave a blank check to the CIA to step up its spying and dirty tricks. Now the SL holds that Lee’s action represents “cracks in the bourgeois edifice,” and that it “reflected the lack of enthusiasm for this war from many black workers and youth.” So here we have a bourgeois politician acting as the voice of discontent among black working people! This is the self-same line presented by the Communist Party and Workers World Party reformists. This alone shows the emptiness of the SL’s pretensions of building a revolutionary workers party. Workers World (here), SL and CP all hail Democratic “dove” Barbara Lee. Or look at WV No. 512 with the front-page headline, “Defeat U.S. Imperialism!” And there it is again in WV No. 513, this time on a Spartacist banner, “Break the Blockade of Iraq! Defeat U.S. Imperialism!” So what changed? What changed is, first, the Persian Gulf War was hotly contested before the shooting began, whereas this time around U.S. rulers have whipped up a real war frenzy; and second, today the Spartacist League capitulates to and even buys into the hysteria. The SL accuses the LFI of...insufficient fervor against Islamic fundamentalism. Unlike the ICL, the LFI has intervened in actual struggle fighting against both Islamic fundamentalism and bourgeois nationalism (see “Algeria: Kabylia in Revolt,” The Internationalist No. 12, Summer 2001). The ICL line that Islamic fundamentalism is ascendant throughout the historically Muslim world, in contrast, means it has nothing to say to anti-fundamentalist youth and workers in Algeria who are confronting a bloody army-based regime locked in a civil war against Islamic fundamentalists. The ICL’s latest sharp turn to the right is a dramatic development: renouncing a cornerstone of Leninist politics in the midst of a war. But it is a part of a pattern of its recent capitulations. Calling for an independent soviet Tibet when “free Tibet” becomes all the rage in rad-lib circles (dropping it a year later when Clinton invites the Dalai Lama to the White House). Renouncing its long-standing call for independence for Puerto Rico even as U.S. imperialism escalates its use of its Caribbean colony as a bombing range and launching pad for invasions. “Barbara Lee, yes – colonial independence, no” might as well be the ICL’s slogan today. Today, while the IG/LFI call for class war against the imperialist war, the SL/ICL calls only for “Class Struggle Against Capitalist Rulers At Home.” This could mean just about anything, including simple wage strikes, and in the context of the SL’s new line, the emphasis on “at home” is counterposed to the call to defeat the imperialists abroad. Yet the history of proletarian struggles around the world underlines that defeats for the imperialists in their aggression abroad foster class struggle within the imperialist heartland, and it is when workers in the imperialist countries come to understand the need to defeat their rapacious imperialist rulers that they can achieve genuinely internationalist class consciousness. The SL line amounts to nationalist, economist social-pacifism. While we’re at it, we challenge the SL/ICL to name one colony in the world today where they call for independence. We’ve asked several SL cadres, and their response was, “I don’t know.” They obviously don’t care much either. Over the course of the last month and a half, following the September 11 attack on the World Trade Center and Pentagon and the imperialist war on Afghanistan by the United States and NATO, many organizations on the U.S. left have reacted true to form. The reformists of the Workers World Party (WWP) and Internationalist Socialist Organization (ISO) predictably set up competing “peace” coalitions, mini popular fronts whose purpose is to head off real struggle against the war by tying protesters to bourgeois political figures such as former U.S. attorney general Ramsey Clark. The Communist Party U.S.A. as usual wrapped itself in the stars and stripes. A slew of smaller groups issued “me too” statements “against terrorism,” in effect begging to be admitted into the imperialists’ “anti-terrorist” crusade. They only want to “give peace a chance” to accomplish the same aims as the war unleashed by U.S. president Bush and his deputy sheriff, British prime minister Tony Blair. One group which made a notable shift is the Spartacist League, U.S. section of the International Communist League (SL/ICL). For three decades the Spartacist tendency upheld the program of revolutionary Trotskyism. In the Vietnam War in the 1960s and early ’70s, the Afghanistan war and Central American civil wars of the 1980s and the Persian Gulf War of 1990-91, the SL/ICL called for defeat of U.S. imperialism and stood on the side of the countries and insurgencies Washington was attacking. But following its turn toward centrism in the mid-1990s (carried out in conjunction with the expulsion of a number of long-time Spartacist cadres), September 11 produced a new and highly significant line change by the SL. We have pointed out that its first statement, under the empty headline “The World Trade Center Attack,” called neither to defend the countries targeted by the U.S. for attack nor for defeat of the mounting imperialist war drive. At most they called to “oppose” eventual U.S. “reprisals,” which is no more than the WWP/ISO did. The next issue of the SL’s Workers Vanguard (28 September) had the equally insipid headline, “Repression, Recession and War,” and was overwhelmingly dedicated to the domestic U.S. situation (an accompanying article did the same for Europe). This time they called for U.S. “hands off” Afghanistan and Iraq, and buried in the fine print they said “defend Iraq” (but not Afghanistan), which again was no more than the reformists were calling for. Indeed, WV’s front page could easily have been mistaken for Workers World. The resemblance was even more striking because Workers Vanguard joined the WWP and CPUSA in praising black Democratic Congresswoman Barbara Lee of Oakland, saying that “to her credit” she was the only Representative to vote against “giving Bush a blank check for war.” Not only does WV not make a single criticism of Lee, it doesn’t mention that even as she voted against the “use of force” resolution, the Congresswoman voted for the $40 billion emergency war credits bill that included a blank check for the CIA! But today WV joins in the uncritical lauding of Democrat Barbara Lee. After all, among its other revisions the SL has now decreed that there can be no such thing as a popular front in the U.S. And how should it distinguish itself from the ISO/WWP when in practice the SL imitated the dueling reformists (front-load attacks on “terrorism,” hail Barbara Lee and her “no blank check for war” vote, and merely “oppose” reprisals rather than wage a revolutionary fight against “their own” bourgeoisie)? The main difference WV cited was the fact that it correctly said “Hail Red Army in Afghanistan!” in the 1980s, whereas the ISO then hailed the CIA’s mujahedin. Finally, after U.S. bombs started raining down on Kabul beginning October 7, the SL came out for defense of Afghanistan. But still there was a curious absence: the WV (12 October) article does not call for defeat of U.S. imperialism and its war. It turns out this is no mere slip. We have learned that the ICL had an internal discussion on slogans in which it decided not to call to defeat imperialism in the war. 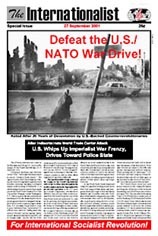 This was no doubt at least partly in response to our special issue of The Internationalist (27 September) prominently headlined “Defeat the U.S./NATO War Drive!” More on this below. What about defense of Afghanistan? WV snidely remarks that “the IG objects because we didn’t join them in their call to defend a country that was not yet under military attack.” Oh no? During the previous weeks we several times challenged SLers to defend their non-defense of the countries in the Pentagon’s cross-hairs. What about the fact that there are three aircraft carrier battle groups off Pakistan, we asked them; what about the fact that teams from the 82nd and 101st Airborne were already operating inside Afghanistan since mid-September; what about the war powers resolutions voted by the U.S. Congress, NATO and UN, etc.? The SLers lamely responded that just because the U.S. fleet is there doesn't mean they're going to hit Afghanistan and they didn't know what the U.S. special forces hit teams were up to (they certainly weren't playing Parcheesi!). We pointed out that during the period from August 1990 to January 1991, when the U.S. fleet and army were lining up for the Persian Gulf War, the SL called to defend Iraq and attacked the reformists for their refusal to do so. (SLers lamely replied that there was a UN blockade of Iraq at the time, but what about UN sanctions against Afghanistan in force for the last two years?) The SL’s new conditions for defending one of the poorest countries on earth under attack by the world’s greatest imperialist superpower are so hairsplitting that it was like they were making a legal brief invoking Article 7 (§b) of the UN charter, more difficult even than getting the proverbial camel through the eye of a needle (Matthew 19:24). And if Afghanistan wasn't under attack why didn't they inform the Afghan population, which had been fleeing Kabul in droves since September 11? If the SL/ICL didn’t know that Afghanistan was under attack prior to October 7, they were the about the only ones on the planet who didn’t. The real explanation for their line is “duck and cover,” and its political content is economist social pacifism. Take WV’s reference (28 September) to “the American bourgeoisie, whose only ‘patriotic’ commitment is to its bottom line.” Perceptive WV readers must have done a double-take over that line, a staple of social democracy which complains that the capitalists have no national loyalties. Some of that “anti-globalization” rhetoric seems to be rubbing off on the ICL. Another significant “tilt” is the emphasis the SL has given in its statements and slogans. First there was the focus on “terrorism” in its initial declaration rather than denouncing imperialism’s war drive. Subsequently, in signs and slogans at “antiwar” demonstrations and in its forums, the SL presents itself as the vanguard fighter against Islamic fundamentalism, making George Bush some kind of Johnny-come-lately. A flyer for an SL forum at Columbia University headlines “Afghan Women Enslaved by Islamic Reaction,” only afterwards mentioning this is “Product of U.S. Imperialism’s Anti-Soviet War.” This is while New York Democratic Representative Carolyn Maloney is getting up in Congress dressed in a burqa (the head-to-toe Afghan “veil”) to make war propaganda over the Taliban’s vicious oppression of women! 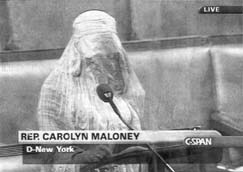 Congresswoman dons burqa, using “anti-Islamic fundamentalist” theme for war propaganda. This is all the more true in a war where revolutionary socialists are duty-bound to defend a semi-colonial country under attack by imperialism. The SL/ICL now, belatedly, says it is for defense of Afghanistan, but is it for the defeat of the U.S.? Not (so far) in the pages of WV. Since its lurch toward centrism in the mid-’90s in demoralized reaction to the counterrevolution that destroyed the Soviet Union and the bureaucratically deformed workers states of East Europe, the SL/ICL has abandoned a series of fundamental political positions. We have documented in The Internationalist how the ICL leadership has rejected Trotsky’s analysis of the nature of the Stalinist bureaucracy and declared that the central conclusion of the Transitional Program, that the crisis of humanity is reduced to the crisis of revolutionary leadership of the proletariat, was outdated in the face of a supposedly qualitative regression in the consciousness of the working masses. What has made a “great leap backwards” is not the consciousness of the masses, however, but that of the SL/ICL. Many of the line changes in WV over the past five years have had a zigzagging character typical of centrists: for example, suddenly discovering feudalism in Mexico in order to accuse the IG of rejecting permanent revolution, then just as abruptly undiscovering this anti-Marxist notion; calling for an “independent soviet Tibet” when Hollywood and Washington were in the heat of a “free Tibet” campaign, then abandoning this a year later. It is noteworthy that many of the SL/ICL’s gyrations are over its attempts to defend itself against the Internationalist Group and LFI, that is against the Trotskyist politics the SL once championed. They also reflect its inability to put forward a revolutionary line every time there is a new development in the class struggle. But there is a “pink thread” going through a number of the SL’s key line changes: the Spartacist League of today has a problem in fighting against its own bourgeoisie. When the U.S. bombed Iraq in 1997, the SL ridiculed us for calling for workers action against the war. (So much for SL’s call during the Vietnam War for workers strikes against the war!) The next year the SL abandoned the call for independence for Puerto Rico, a position it had held since its inception, following the line of Trotsky’s Fourth International, instead calling only for its “right” to independence. (This is the same line the French CP leaders took when they abandoned the call for independence for Indochina and Algeria in the 1930s.) It disingenuously calls the IG/LFI “nationalist” for insisting on independence for all colonies, a key point for admission to the Communist International under Lenin and Trotsky. In the present war, the SL has taken a real dive. First it refused to call for defense of Afghanistan until the bombs started falling, and now it still refuses to call for defeat of U.S. imperialism’s dirty war. We will see how they attempt to defend this line in print. A side point: WV (28 September) comments that “the reformist left adapts to the bourgeoisies of their respective countries. In West Europe, this takes the predominant form of anti-Americanism and support for the social democrats who today administer many of the imperialist states.” Quite true, and a genuinely internationalist leadership must fight such chauvinist currents, as we also fight in heavily Muslim countries against Islamic reaction and bourgeois nationalism. And in the United States today, one form of adaptation to the bourgeoisie is joining Washington’s chorus against anti-Americanism and Islamic fundamentalism while not simultaneously taking a clear position for the defeat of U.S. imperialism. Historically the defeat of imperialist countries waging colonial wars has had a tremendous effect in favor not only of the colonial subjects but also for the working class in the metropolitan country. Look at the example of France and Algeria. The French defeat at the hands of the Algerian independence fighters culminating in 1962 demoralized the French bourgeoisie and helped lead to the worker-student revolt of 1968, which posed the first potentially revolutionary crisis in Europe in years. Were the U.S. to get bogged down in drawn-out fighting in Afghanistan, setting off unrest throughout the Near East and South Asia, this could have tremendous revolutionary impact throughout Asia while throwing a wrench into attempts by the American and European bourgeoisies to intensify exploitation and police-state measures against the working class. To take advantage of such opportunities requires the intervention of a Trotskyist vanguard fighting for class war against the imperialist war. Looking to the example of Lenin’s Bolsheviks, this is what the Internationalist Group, U.S. section of the League for the Fourth International, fights for today. Only such a vanguard will be able to dispel pacifist illusions, while fighting Islamic fundamentalism and bourgeois nationalism in the semicolonial countries. A party which fails to fight for defeat of the most vicious state terrorists of all, the rapacious U.S. bourgeoisie and its blood-soaked military machine, is no vanguard at all. And, needless to say, it will certainly never be able to arouse the toilers of Asia against the false leaders they look to today.